Chinese herb(al) tea or medicinal herbal tea is a kind of infusion made from purely Chinese medicinal herbs in Guangdong (Kwangtung), China. It usually tastes bitter or lightly sweet and its colour is typically black or dark brown, depending on what kinds of herbs are used. Although it is referred to as "tea", it seldom contains any part of the tea plant (Camellia sinensis) and is thus a herbal tea. Cantonese people boil what are referred to as cooling herbs in Traditional Chinese medicine to make herbal tea, which is consumed in order to relieve the heat and humidity in the body. Therefore, Chinese herb tea is referred to as cold tea or cooling tea in the Chinese language. There are many kinds of cooling tea. Different kinds of tea are purported to cure or relieve a variety of diseases. Some teas are consumed to alleviate sore throats, some for flu, and others for a number of ailments. Cooling tea is quite popular in Guangdong, Macau and Hong Kong,. Many families make their tea at home. Some families are herb tea specialists who open their own shops, selling different kinds of herbal tea. Some shops have been open for 150 years in Guangzhou and 50–60 years in Hong Kong. In 1990s and 2000s, cold tea has been bottled, canned or boxed by some herbal tea specialists and is being sold in supermarkets in Asia and Asian markets overseas as fewer and fewer families have time to make them at home. These products are usually sweetened. Chinese herb tea plays a crucial role in the title and the plot of the 1961 novel Eat a Bowl of Tea by Louis Chu. The history of herbal teas is said to have started in approximately 350 A.D. due to the efforts of an individual named Lu Yu (陸羽) writing in Chinese upon a parchment scroll entitled ‘The Classic of Tea’ (茶經) that included information regarding the cultivation, processing, and uses of tea. But the first cup of tea is said to have been born in an accident thousands of years earlier: It is said that, in 2737 B.C, there was a Chinese Emperor named Shen-Nung (神農) who was boiling some water — a commonly practiced method used to purify water — whereupon some leaves from a nearby bush unexpectedly blew into the pot. He, however, did not see that occur and covered the pot while the leaves still floated in the water. Subsequently, smelling the scent of the brew, he became curious and tasted it. This became the first born of teas, evolving over the centuries into the herbal and medicinal teas of today. Shen-Nung also wrote a book entitled ‘Shénnóng Běn Cǎo Jīng’ (神農本草經). The book stated that "Shennong tasted hundreds of herb, he encountered seventy two poisons daily and used tea as an antidote". The book also includes various uses and function of herbs. The natural herbal teas in China have been used to help boost health of human bodies physically and mentally and also heal or prevent illness that are the main aspects of health benefits and medical uses for Chinese. People therefore increase their immunity and keep healthy gradually. Also, it includes antioxidant properties that have positive medicinal effects on human bodies. The ingredients of herbal teas are mainly fresh dried flowers, leaves, seeds or roots, and grains. Those ingredients are easily found in the nature worldwide. Needless to say, Chinese herb tea is described as wisdom crystal of China because of its multi-curative functions. It is also viewed as an intangible cultural heritage which is supposed to be preserved and promoted actively. In Chinese traditional culture, harmonious relationship between human being and nature is highly pursued. Integrating human being into nature (tianrenheyi) is deemed as the ultimate goal in traditional philosophy so human being is part of nature indeed. Such concept can be applied to understand how Chinese herb tea refers to Chinese identity. All the ingredients of Chinese herb tea can be directly found from nature and used without purification or any complex chemical reactions so Chinese herb tea is symbolized as nature. Natural characteristic of Chinese herb tea implies that Chinese people is advocator of nature in the traditional belief. It is believed that they can merge with nature and thus utilize the powerful impact of nature for defense against disease and maintenance of health by intake of Chinese herb tea.This way of thinking demonstrates what Gabaccia (1998) call we are what we eat. Chinese herb tea not only represents Chinese understanding of medical science and nature but also reflects their collective identity which is aspiration for natural integration and oneness. Traditional Chinese herb tea shops are family-run business and have been passed down from generation to generation. This business model signifies the significant of family in Chinese philosophy. Protection of the intangible cultural heritage was an international issue. In 2003, UNESCO established an International Convention to protect these heritages, which acted as the basis in international law for many other countries. China also approved this convention in 2004. 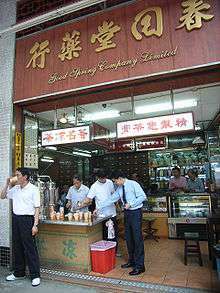 In 2006, the governments of Mainland China, Hong Kong and Macau jointly applied the Chinese herb tea as the Chinese Intangible Cultural Heritage. The Chinese herb tea successfully passed the first round examination and became No. 439 under the category of traditional handicrafts in the protection list. Status recognition of it under international approval facilitated its modernization and globalization into other countries. According to the assessment criteria, this implied that the country recognized the Chinese herb tea’s outstanding and unique value to show Chinese traditional culture. The Chinese herb tea was guided by Traditional Chinese Medicine Theory (TCM) and used herbs as raw material to conclude a prescription. Over a hundred years, it has been associated with Chinese daily life. It was part of the Chinese food culture. The traditional business mode of herb tea was selling on four-wheel trolleys that raise a glass lamp. Two large teapots were installed on the trolley and many teacups and stands were placed in front of the frame. In the impression, there was usually an old man who wore short blouse and pants peddling continuously. After the baptism of decades, the old traditional hawking model has been eliminated. Currently, many herb tea companies adopt one stop management that covers the production and sales. This management strategy emphasis on standardized and specialized chain management as well as strict quality control. These modern production lines and complete sterilized facilities have fully replaced the old-fashioned crock and form the modern business model of herb tea. Besides modern business mode, the essence and effectiveness of herb tea are the most important elements in operating a successful herb tea enterprise. According to the modern dietary habits, enterprises improve those traditional recipes according to different seasons. They produce more than a dozen varieties herb tea, such as Fructus Cannabis (火麻仁), that suitable for those who afraid of bitter taste. In addition, as to further expand its consumer base, herb tea produce into paper canned packaging, which are more convenience and meet customer needs. Herb tea has a long history in China. It also known as medicinal herbal tea, which is a kind of tea-soup made from purely Chinese medicinal herbs in Guangdong. The drink is made to drive away the heat inside the human body in summer or to cure the sore throat caused by dryness in winter and other illnesses. Youngers receive these traditions and messages from their families and we can now observe that many customers are young people. Besides, as higher occurrence of cardiovascular diseases and cancers in younger age group, more people concern on health care issues and thereby stimulate their consumption inclination. The brand of herb tea in china called “Wong Lo Kat Herbal Tea” launched by Wang Zebang from Heshan in 1828. In the very beginning, the Chinese herb tea can only provided by the shop on the street. It is used to be prepared, when someone orders, the Chinese herb tea will serve in a traditional bowl, and the customers will need to finish it before leaving. When Chinese herbal tea becomes more popular, the demand is way higher than the supply .It is because producing a Chinese herbal tea needs couples of hours. Obviously, it cannot fulfill the demand of the market immediately. This way of producing Chinese herbal tea needs a change, in an advance way. After that, Wang Zebang has a new idea to sell Chinese herbal tea. He decided to design packets of herbal tea bag. Customers can buy the herbal tea bag and boil it by themselves. This is the initial stage industrialization of Chinese herbal tea. The rapid development of modern technology has been bringing considerable changes to the way of producing Chinese herbal tea. Chinese herb tea was made in a pack of granulation (涼茶精) which is easy to be served, no need to boil for couple hours before it served, but to be taken dissolved in boiling water. Producing Chinese herbal tea in such standardization is a trend. Later, “Wong Lo Kat" invents a new way to sell Chinese herb tea, in canned. In 1990s and 2000s, Chinese herb tea has been bottled, canned or boxed by some herbal tea specialists and is being sold in supermarkets in Asia and overseas as fewer and fewer families have time to make them at home. The modernization of herbal tea has change its market, without a doubt, global marketing. It sales cover nearly 20 countries, including China, the US, Canada and France etc. There’s a wide variety of cool herbal tea drinks to choose, such as mulberry and chrysanthemum drink, lotus leaf drink and fresh lotus root drink etc. ↑ patton, luisp. "Essence Of Stress Relief". soul herbs. luisppatton. Retrieved 7 August 2015. ↑ Naithani, V; Nair, S; Kakkar, P (2006). "Decline in antioxidant capacity of Indian herbal teas during storage and its relation to phenolic content". Food Research International 39 (2): 176–181. ↑ Lam, K. Y.&Wong, Y. L. (1998). Zhongguo wen hua dao lun. Hong Kong: Hong Kong Educational Publishing Co.
↑ Gabaccia, D. (1998). We are what we eat: ethnic food and the making of Americans. Cambridge, Mass: Harvard University Press. ↑ Wu, L. (2007). "Hong Kong Herbal Tea: A Study of Intangible Cultural Heritage" (PDF). The Hong Kong Anthropologist (in Chinese). 1: 99–104. OCLC 29371328. Retrieved December 13, 2012.